Although “cerebellar ataxia” is often used in reference to a disease process, presumably there are different underlying pathogenetic mechanisms for different subtypes. Indeed, spinocerebellar ataxia (SCA) types 2 and 6 demonstrate complementary phenotypes, thus predicting a different anatomic pattern of degeneration. Here, we show that an unsupervised classification method, based on principal component analysis (PCA) of cerebellar shape characteristics, can be used to separate SCA2 and SCA6 into two classes, which may represent disease-specific archetypes. Patients with SCA2 (n = 11) and SCA6 (n = 7) were compared against controls (n = 15) using PCA to classify cerebellar anatomic shape characteristics. Within the first three principal components, SCA2 and SCA6 differed from controls and from each other. In a secondary analysis, we studied five additional subjects and found that these patients were consistent with the previously defined archetypal clusters of clinical and anatomical characteristics. Secondary analysis of five subjects with related diagnoses showed that disease groups that were clinically and pathophysiologically similar also shared similar anatomic characteristics. Specifically, Archetype #1 consisted of SCA3 (n = 1) and SCA2, suggesting that cerebellar syndromes accompanied by atrophy of the pons may be associated with a characteristic pattern of cerebellar neurodegeneration. In comparison, Archetype #2 was comprised of disease groups with pure cerebellar atrophy (episodic ataxia type 2 (n = 1), idiopathic late-onset cerebellar ataxias (n = 3), and SCA6). This suggests that cerebellar shape analysis could aid in discriminating between different pathologies. Our findings further suggest that magnetic resonance imaging is a promising imaging biomarker that could aid in the diagnosis and therapeutic management in patients with cerebellar syndromes. Statistical analysis was completed by B.C.J. and S.H.Y. (from The Johns Hopkins University). This work was supported by the Arnold-Chiari Foundation, the Robin Zee Fund, the Dana Foundation Program for Brain and Immuno-Imaging, the Research to Prevent Blindness Core Grant, and the National Institutes of Health (grant numbers 1K23EY015802, 5T32DC00023, 5T32MH019950, 5T32GM007057, R01 EY01849, 1R01NS056307, R01NS054255, 5RC1NS068897, 5R01EY019347, and 5R21NS059830). We would also like to thank Mimi Lee and Elizabeth Murray for their technical assistance. There is no financial interest to disclose. Jung BC, Choi SI, Du AX, Cuzzocreo JL, Ying HS, Landman BA, et al. MRI shows a region-specific pattern of atrophy in spinocerebellar ataxia type 2. Cerebellum [Internet]. 18 Aug 2011 [cited 11 Oct 2011]. Available from: http://www.ncbi.nlm.nih.gov/pubmed/21850525. 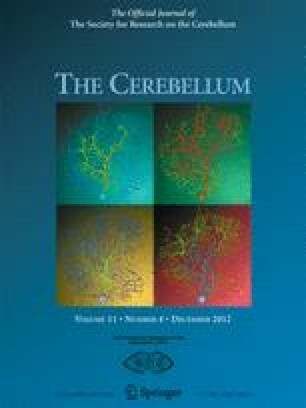 Rajakulendran S, Schorge S, Kullmann DM, Hanna MG. Dysfunction of the Ca(V)2.1 calcium channel in cerebellar ataxias. F1000 Biol Rep [Internet]. 2010 [cited 1 Jun 2011]; 2. Available from: http://www.ncbi.nlm.nih.gov/pubmed/20948794.